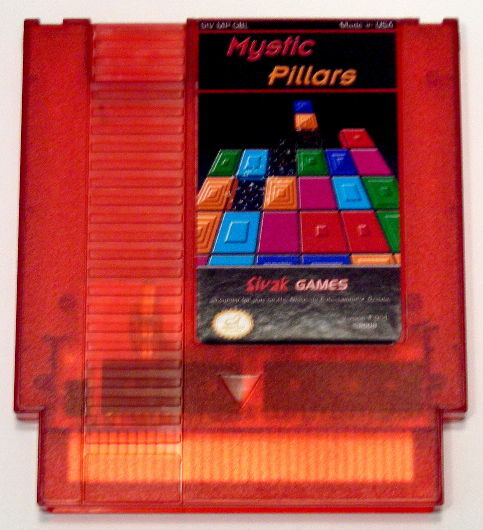 You must guide pillars of tiles to form a row, column, or diagonal of 3 matching tiles. Doing so will clear those tiles and all overhead ones will drop down. 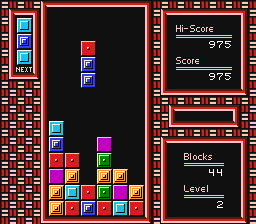 Make combos doing this to score more points! Game speed increases for each level up. 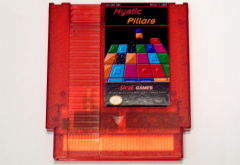 Periodically, a pillars of magic tiles will be granted and this tile will clear all tiles of the same type it lands upon. 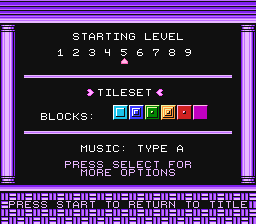 Features include 5 selectable tilesets, 3 music tracks, and 8 selectable backgrounds. 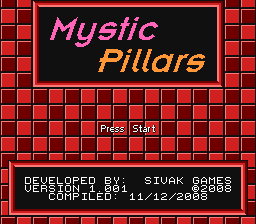 Mystic Pillars Intro Music and Graphics options Stack! Untested on Famicom using 72-60 pin converter.